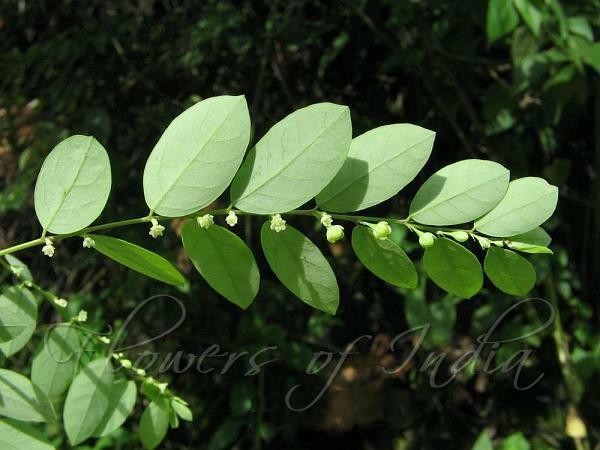 Kozhikode Leaf-Flower is an erect annual herb, growing up to 2 ft tall. Leaves are elliptic or obovate, hairless, galucous, 2.5 x 1.5 cm, blunt to somewhat pointed at the tip, rounded at base. Leaf stalk is about 1 mm long. Male flowers are greenish-white, 2.5 mm across, in fascicles of 2-3 in leaf axils. Tepals are six, nearly equal - outer three ovate, pointed at tip, inner three ovate, blunt at tip. Stamens are three, filaments fused, anthers splitting transversely. Female flowers are green with prominent white margins, 3-4mm across, solitary, in leaf axils. Tepals are six, same as male flowers, styles three, spreading. Capsules are depressed round, 3mm, hairless with accrescent long tepals. Seeds is trigonous, vertically channeled. 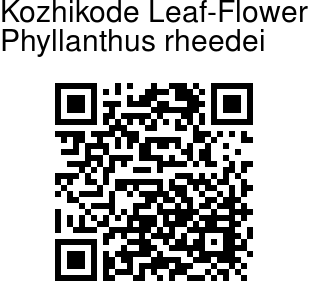 Kozhikode Leaf-Flower is found in Kerala and Eastern Himalayas.